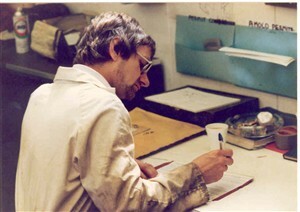 The Photograph shows Michael Thompson filling out paper work onboard a platform. Courtesy of Michael Thompson. The ones who had trouble like I said are those with kiddies birthdays and they used to bring the whole morale down, some of these guys. I have often seen full grown guys crying cause they miss being home... We used to have our Christmas either before I went or when I came back." This page was added by Richard Dade on 10/02/2007. The best treatments for buhcter block counters are inert oils which can continually be reapplied to the surface of the wood. These oils fill in the natural pores in the wood and repel other oils, liquids and food which may contaminate the surface. Only inert oils are safe for use in treating buhcter block counters. Vegetable or other cooking oils will eventually turn rancid and give your counters a spoiled food odor.